Solara An-Ra : Recent Channellings - The Star Councils on: THE GREAT ACCELERATION! This is not the first period of ‘great acceleration’ in which you have been immersed, dear ones. There have been many, many periods of acceleration, even within your own lifetimes – but certainly within the great cycles and epochs of the universe. Much like embryology – where there is always a contraction of the embryo or foetus before an expansion occurs – in the universal cycle, there are contractions and expansions. There are periods where the consciousness of your planet rises, and then periods where it falls again. And so, we will speak about a very specific period which is relevant to you now. This acceleration started in the last quarter of 2017, and is relevant all the way through to the March Equinox of 2019– a time-window of approximately 18 months in your time-line. This is the first period of acceleration which is more powerful than that which occurred around the 12.12.12 – and it is for many reasons that this is so. Some reasons, yes, lie in astrological alignments – but greater than this factor is the Light-work which has been achieved over the period between the 2012 December Solstice and your now-moment. Your commitment to reconnecting the Light Grids of Gaia; to doing your Light-work in the places of power on your planet; to helping others to awaken in so many ways – it is these efforts which have succeeded in allowing the Light to shine through the cloud which restricted your consciousness in the Age of Pisces. Within this time-window there has also been much difficulty; there have been great struggles between the Light and the dark, and there has been much turbulence – that which has been termed ‘chaotic nodes’ through the Hathor channellings. And these ups and downs have coalesced, finally, into this place and time where there is an explosion-like opening or portal which is accessible to those who are ready to step through the door. This opening concerns the expansion of your consciousness. We will elucidate. We teach at the moment about your AWAKENING LIGHT BODY. We teach techniques that allow you to experience yourselves as LIGHT; as more expansive than your auric body and field. We speak of the frequency which raises within your Greater-Light-Body, in order to allow the appropriately timed downloading of codes. And we see these codes literally downloading within your Light-Bodies as we speak – hieroglyphs illuminating like flares, and then integrating into your Light, making your overall energy more crystalline and rarefied. There is a completely different texture to this Light – that which we describe as blue-white or star-like light. And so to understand this Great Acceleration from another perspective, think simply about your ability to access higher dimensional concepts or experiences. Think simply about your individual ability to experience energy flows, such as the energy vortices or chakras within your own body. Acknowledge also how much easier it is to feel, see or accept the existence of the chakras outside of your physical body – the spinning discs above your head and below your root chakra. And you will thus come into a realisation of how much you have shifted – how much you have accelerated in terms of consciousness expansion and the opening of your extra-sensory or psychic abilities. 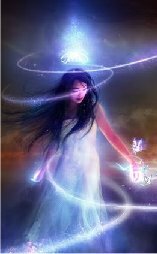 There are a myriad of higher dimensional openings within you as you step through these energetic and psychic gateways. To give but one example: as your consciousness expands, you are automatically shifted up into a space where you are able to experience not only your personal heart centre, but also the Higher Heart and the One-Heart chakras. And we will expand on this example now, in order to further demonstrate your acceleration. Think about your understanding of your personal heart chakra, dear ones, which relates to the energetic exchanges in your personal relationships. It encompasses your ability to give and receive love, your ability to forgive those who have sinned against you, letting go of old grievances – and thus your capacity to truly open up to being a more loving person to the people with whom you interact. And then step UP one level into the concept of the Higher Heart, where you are able to perceive all other human beings on your planet as loving and loveable.If you are able to perceive this, even for a short while – to absolutely forgive and let go of judgements – then you are able to access the energy and the purpose of the Higher Heart. And step UP one level from this, and think of your One-Heart Chakra; that which is the heart energy of your Higher Self. The One-Heart places you in energetic resonance with all others on the planet who are able to access their Higher Selves also. It enables you, not only to love all others beings, but to spontaneously be in energetic resonance with these others. You experience yourself as one with them. You are also able through the One-Heart resonance to psychically see into the hearts of others in whom the One-Heart is awakened. There is a connection between your One-Heart chakra and your Soul Star Portal chakra – when the former is awakened, you are able to both sense the energy of your Soul-Star family, and to attract these beings towards yourself. And so this, roundabout as it may seem, is an explanation of the acceleration in which you are immersed. For if on some level you have understood the 3 levels of the heart that we have described, you may be assured that your consciousness is expanding. Understanding and being able to experience higher dimensional concepts is an indication that you have truly stepped through a new doorway. The great acceleration is, indeed, a quantum shift happening within your consciousness – and the correlating acceleration of your spiritual evolution. Above and beyond this, when you awaken or integrate a new gift or ability – of psychic seeing, for example – this is not only accessible to the few people with whom you come into contact on a physical level. This new ability becomes accessible to many, many beings within your world – for these gifts and these higher levels of consciousness are contagious, if you like. They simply leap out of your energy field and become accessible to others! And it is for this reason that we ask you to repeat often: ‘WE ARE THE AWAKENERS!’ – so that you integrate the idea that it is you, you, you – YOU who are one of the awakeners! Do not judge your progress, dear ones, according to the lowest frame of mind that you access in any one day, for this is just the remnants of the infection of lower consciousness that has pervaded your world. You can brush these lower thought forms off of yourself – you can expel these negative, fear-based, separation-based thoughts, simply by constantly bringing yourself back into a higher vibration, and re-aligning with the co-creation of the New Earth, based on love, kindness and cooperation. You are practising being Light-Beings! You are practising remembering and experiencing your multi-dimensional Star-Being identities. And we hope we have assisted in your understanding. Namaste.